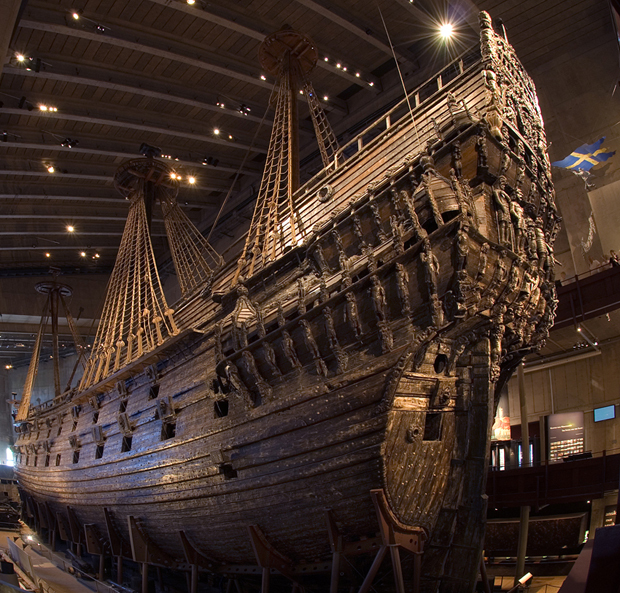 In 1628, the Swedish warship Vasa sank on its maiden voyage. Over the centuries, many have tried to explain what caused that embarrassing and deadly mishap. Researchers in Stockholm have now conducted a detailed examination of the 17th-century vessel, and they've found new clues as to why it sank. "It's like a piece of art," says Susanna Vallejos, a guide at the museum. The ship, especially its stern, is covered with wooden sculptures. "They're very beautiful, of course, but the main use of them was to tell us things about the royal family, the king," says Vallejos. Vasa set sail on her maiden voyage on August 10, 1628. At the time, she was the most powerfully armed warship in the world, with 64 bronze cannons. Twenty minutes into her journey, the ship was hit by two strong winds. It heeled to port, water gushed in, and the ship sank less than a mile into the journey. Fred Hocker, an archaeologist at the Vasa Museum, has been trying to find some definitive answers. "We have, over the last three years, measured every single piece of the wood in the ship," says Hocker. "If we want to understand how the ship was built, that's what it takes." Hocker's meticulous measurements paid off. They gave him fresh insight into what made the Vasa unstable. For one thing, the ship was asymmetrical, more so than most ships of the day. People in the 17th century were aware of that fact, but they didn't understand what made the ship top-heavy, or whom to blame for the poor design. Some historians and military architects have blamed the King. They thought that he had interfered with the ship's dimensions after the construction had begun. But Hocker's measurements offered no evidence to support that theory. He uncovered a simpler cause. Despite its unfortunate end, the ship was lucky in one regard; it sank in waters that helped preserve it for more than three centuries. Since it was brought up, the ship has provided a rare glimpse of life in the 17th century. Now that Hocker and his colleagues have uncovered the reasons behind the Vasa's sinking, they're working on a more pressing problem: how to preserve the ship now that it is out of the water, to ensure that people can see it, and hear its story, for centuries to come. In Arts, Culture & Media and Science, Tech & Environment.